Here we go, the last stretch for spring 2019...FINALS! The past couple of weeks and weekends have been filled with cramming 15 weeks worth of nine classes into one to two hour exams for the last time. Success in learning is to keep practicing and reviewing until it becomes second nature. One of the classes I took every Friday evening this trimester was Tai Chi. Have you ever wanted to be a superhero? To be able to use your eyes to fix things, fly around or cool equipment to battle? When I was growing up, boys wanted to be Superman or Batman. Girls probably idolized the same as the boys, because there weren’t that many female superheroes when I was growing up. But, then again, male superheroes were cooler. Nowadays, Wonder Woman or the most recent, Captain Marvel are popular. You idolize them, and would do anything to be their shadow. You mimic their actions, dress like them, and eventually try to change yourself to be a mini version of them. Another blur in my life at NUHS, but a good reminder that I am in medical school. The past couple of weeks were busy preparing for midterms. Along with papers and projects, many of us had to take boards or entrance exams to prepare for the next step for advancement in the program. Being in school is go...go...go non-stop; but, all of us continue to have each other’s backs! The wheels of the car went round and round as we headed South, with the temperatures increasing by increments of about 20 degrees through each state. I am still in shock that we were able to feel such profound differences of cold and hot within less than 24 hours! “The best part of waking up is…” not having Folgers in your cup, but hearing "'there is no school due to below zero temperatures.'" Here I am entering the beginning of my fourth trimester in the Acupuncture and Oriental Medicine program, and it’s good to be back to the old routine. Don’t get me wrong, it was great seeing family and friends over holiday break. But, being in class zooming around as a busy bee and working toward a big goal for myself is the most amazing feeling! During break, I felt like a lump on a log. Waking up and doing practically nothing other than being lazy, catching up on Netflix shows. Starting up classes and seeing familiar faces allows me to be back with my NUHS family while away from home. As students going through the same academic challenges, we are able to reflect and guide each other forward. “Life is really simple, but we insist on making it complicated.” ̶ Confucius. As I sit here at Barnes and Nobles studying, I am taking a bit of time to reflect on my life and the events of these past few weeks. Looking out the window as people are hustling and bustling, starting their holiday shopping, life seems a whirlwind of events that we are all robotically carrying out. Meet Me in the Media! How would you feel if technology just went...BLOOP...gone!? 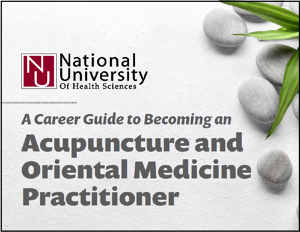 Interested in learning more about a career in acupuncture and/or oriental medicine? Check out our guide!